Mario Monicelli's 1963 drama is planned for an April Blu-ray release. 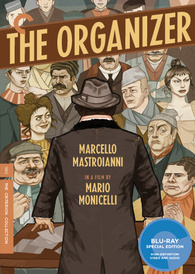 In an early announcement to retailers, the Criterion Collection says 'The Organizer' is coming to Blu-ray on April 24. This historical drama by Mario Monicelli is a beautiful and moving ode to the power of the people, brimming with humor and honesty. The Blu-ray will feature a 1080p transfer, uncompressed mono soundtrack, and supplements include: Introduction by director Mario Monicelli from 2006, Trailer, and an essay by film critic J. Hoberman. You can find the latest specs for 'The Organizer' linked from our Blu-ray Release Schedule, where it's indexed under April 24.